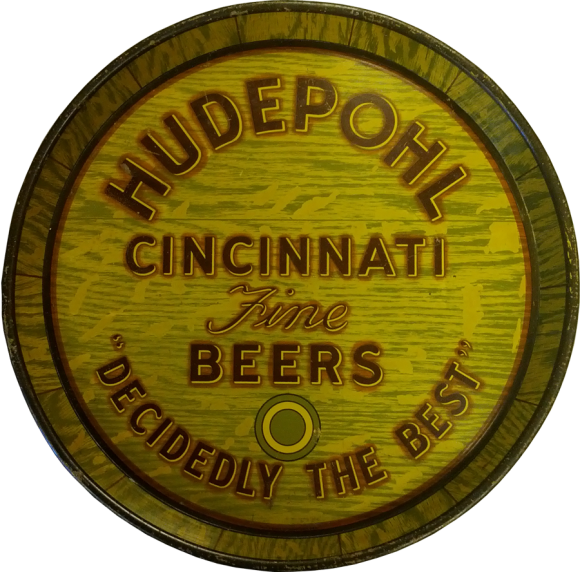 This tray for Hudepohl Fine Beers out of Cincinnati has the tagline “Decidedly the Best”. It has a great wood-grain look and the outer edge even has dividing lines to make it look like it was constructed of slats like a barrel. The tray was made by the HD Beach Company of Coshocton, Ohio as shown below. This tray really has a great design and is stunning on display at an unusual oversized size of 15 inches. This is one of the rarer Hudepohl trays out there so it can bring a nice price.